and clinching the 2018 Factory Stock Championship. The SAMTech.edu NHRA Factory Stock Showdown returns to NHRA Mello Yello Drag Racing Series events in 2019 and will expand to eight races during the year. The wildly popular category will make inaugural visits to the Virginia NHRA Nationals in Richmond, Va. and the Menards NHRA Heartland Nationals in Topeka, Kan. The SAMTech.edu NHRA Factory Stock Showdown series will compete at the Amalie Motor Oil NHRA Gatornationals, NHRA Four-Wide Nationals, the events in Richmond and Topeka, the Summit Racing Equipment NHRA Nationals, Chevrolet Performance U.S. Nationals, the AAA Insurance NHRA Midwest Nationals, and will conclude at the AAA Texas NHRA FallNationals. Drivers will once again be competing for a year-end NHRA Wally based on all eight events counting towards the championship. 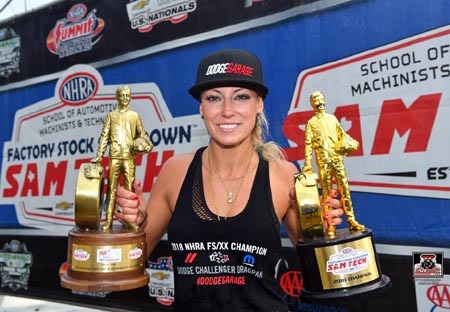 The 2018 SAMTech.edu NHRA Factory Stock Showdown champion was Leah Pritchett who raced to three consecutive wins in her Mopar Dodge Challenger Drag Pak during the year. "The high level of competition on the track within the Samtech.edu NHRA Factory Stock Showdown continues to be a fan favorite," said Josh Peterson, NHRA vice president, racing administration. "The support provided by Samtech.edu and the automobile manufacturers has helped the class see continued growth in participation." "When SAM Tech signed on to sponsor the Factory Stock Showdown, we knew it was a special class however, we didn't expect it to gain the notoriety it has in so little time," said Brian Massingill, director of student motorsports for the School of Automotive Machinists & Technology. "In three short years, we have gone from four races to eight, from 8.50s to 7.90s, and from 8 car fields to 16. The enthusiasm from the manufacturers, racers, and drivers has helped propel this class to a fan favorite. With continued support from the NHRA, this class will keep growing for years to come. Whether it's prospective jobs for our graduates, class projects on the track or experimenting with new ways to make horsepower in our labs, the opportunities the Showdown provides students, faculty and staff at SAM Tech are irreplaceable. We are excited to see what the future holds for the SAMTech.edu Factory Stock Showdown." March 14-17      Amalie Motor Oil NHRA Gatornationals     Gainesville, Fla.
April 26-28      NHRA Four-Wide Nationals                 Charlotte, N.C.
May 17-19        Virginia NHRA Nationals                  Richmond, Va.
June 7-9         Menards NHRA Heartland Nationals         Topeka, Kan.